Following the July, 13, 2013 verdict of the Trayvon Martin court case, Oakland was one of the cities that saw a series of protests in response to the decision and broadly in favor of social justice in the criminal justice/prison system. Many of the below updates were made in realtime as the protests were going on. 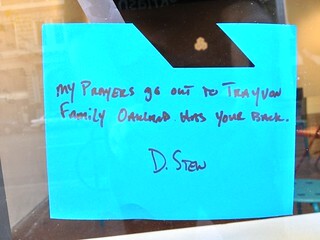 Thank you to everyone who helped document these events and their aftermath. Cops line a street, 2013-7-132013-07-13: First night of protests following the verdict with ~2-300 people protesting. There were a number of broken windows downtown after the night. Early in the night (10PM - midnight) the protest followed a route down Broadway (holding the streets) then headed toward the Police Station. The march largely died down and the ensuing vandalism happened with a much smaller group. 2013-07-14: Protesters reconvened in the afternoon and marched through West Oakland after returning to hold the intersection of Broadway and 14th St. 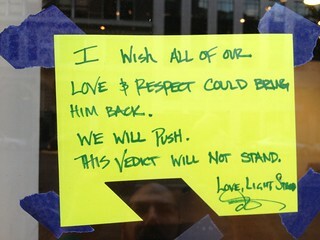 The public shared their thoughts of the day in notes on the windows of the Beti Ono Gallery on Broadway. 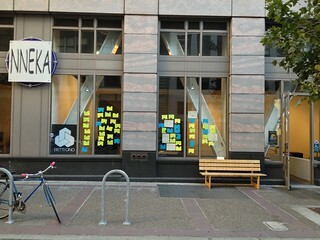 Additionally, the downtown shoe store SoleSpace turned itself into a community art space with posters on the windows, chalk on the sidewalk, and water and art-making offered inside. One comment of more than 60. 2013-07-15: Protests resumed once again in the afternoon. Inspired by the previous day’s actions in LA, where protesters shut down Highway 10, approximately 70-100 protesters marched onto Highway I-880 and blocked traffic for less than an hour before leaving the highway. The Oakland Police Department made the decision to not arrest protesters who blocked the highway (the first time in Oakland’s history that this decision was made). 9pm A still mostly peaceful protest gathered in front of the courthouse, where anyone who wanted to was allowed to speak. 10pm Protesters make their way down 12th street. Turning right onto Broadway, things start to devolve: a masked protester smashes Comerica windows; as the crowd passes Men’s Warehouse the double-storey panes are broken and kicked in. Police sprint and chase the glass-breakers, tackling some to the ground. Crowds form around the downed protesters. The police try to make their arrests and retreat, with the protesters heckling their back-pedaling. A police flashbang is thrown into the crowd. More jeering ensues, and as the protesters approach too closely, light pushing by police turns into more arrests. Retaliatory fireworks are thrown back at Police lines. 10:30 the crowd continues down Broadway, stopping briefly at Ogawa Plaza, but enlivened and continuing to break glass, overturn trashcans, and light trash on fire. Window panes are destroyed directly adjacent to boarded windows that were smashed only nights ago. The boards are graffiti’d at leisure with the police in slow pursuit. A left on 17th, a right on Telegraph. Protesters and a waiter from the restaurant Flora got into an argument which resulted in the waiter being attacked with a hammer to the head [source]. Protesters turned right past a bus at Berkeley Way. A left on Franklin to tour some banks. Mass window breaking on Franklin, with the police rejoining from behind. Suddenly a rush onto Broadway and down Grand to Telegraph. Trayvon Martin Mural on boarded up broken Youth Radio windows.11pm Telegraph between Grand and 27th returns to late night church graffiti - but this isn’t the Art Murmur of yore. Silhouetted megaphones bark a penal code number: “California has declared this an unlawful assembly. [sic] All attendees may be arrested regardless of purpose. You may be harmed in peace-keeping operations.” Engines roar and a wave of on-foot police and armored SUVs sprint at the crowd. The protesters panic and flee at full speed on bikes and their own feet. 11:30pm The protesters are dispersed; fear tactics have won. 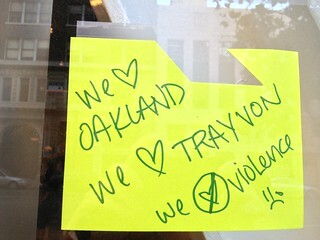 Well done Oakland Police Department. Questions remain: Will they be paid overtime? And what’s for dinner, I’m starving. Midnight. The streets are more silent than usual. A few cop cars slink past nonchalantly. Raised donuts clink at the all-nighter. Flasks are passed around, illuminated by the glow of twitter clients across all of Oakland’s suburbs. Both Dan Kalb and Desley Brooks were seen at the protests early in the evening, before the protesters took the freeway. City Council candidate Sean Sullivan was spotted at the protest later in the evening. 2013-07-16: Protesters and polic appear to be in a "standoff" as of 10PM. According to twitter, approximately 30 protesters were surrounded by many officers [source]. Individuals in the Frank Ogawa Plaza area are being told to avoid jaywalking and riding bikes through red lights [source]. The protest appeared to be mostly over by 11PM. 2013-07-20: Oakland had a rally at noon at Frank Ogawa Plaza as part of a national day of protests [source]. https://twitter.com/christinKPIX5/status/357367411332243456/photo/1 & https://twitter.com/EvanWagstaff/status/357370025021157376/photo/1 7/16 Protester and police "standoff"
"Weekend Protests Peaceful – On Friday, July 19, the Oakland Police Department (OPD) prepared for a second weekend of assemblies and marches in response to the Zimmerman verdict. Interim Chief Sean Whent called for increased staffing, regular days off were cancelled for sworn members and many civilian staff members worked Friday, Saturday and Sunday to ensure that OPD could respond appropriately to protests and marches. No incidents were reported. The City of Oakland is committed to supporting peaceful assembly and freedom of speech, but will not tolerate acts of violence. For more information, please contact Sgt. Holly Joshi, OPD Chief of Staff, at hjoshi@oaklandnet.com or (510) 238-3131. " Thomas Frazier, Compliance Director, criticized the response of the department, calling the events easily anticipatable. According to Matthew Artz, "police had been warned that protests would be likely if George Zimmerman was acquitted in Martin's death and were asked to provide their plans for dealing with protests. Fixing the department's intelligence system will now become a top priority that must be addressed before federal oversight of the department is lifted (see article from 8/1/13, also listed below). At the Public Safety meeting following the protests, the committee spent a lot of time talking about what went wrong and what they could do. Councilmember Lynette McElhaney (D3) spoke about how the black community, especially in West Oakland, was frustrated by protesters claiming to speak for them, when in fact violence and vandalism had nothing to do with the verdict or the shooting of Trayvon Martin. She also told Chief Whent that citizens were considering "taking matters into their own hands" and asked what he suggested. Whent said that he could not advocate this and attempted to assure McElhaney that OPD was adequately prepared for future actions. Councilmember Libby Schaaf (D4) asked a lot of questions about protesters and marching on the sidewalk. She seemed very concerned about the safety aspects of people in the street. Whent explained that OPD would facilitate marches and free speech, permitted or not, and that, while illegal, marching in the street was less of a priority than keeping the peace and facilitating free speech. Schaaf followed up with McElhaney's question asking if they could encourage their constituents to come out and stand against windows with bright flashlights. Whent said yes, encouraging a type of vigilanteism. Councilmember Dan Kalb (D1) asked about mutual aid and staffing. He asked Chief Whent why mutual hadn't been called in more often and earlier. Whent explained that mutual aid can only be used during emergencies, and emergencies can only be declared at the moment of the emergency. Kalb questioned this- if you knew a protest had gone badly and there was going to be another the next night, why couldn't you call aid ahead of time? Whent explained that this was not how it worked, and that even in the case of a hurricane or natural disaster that you knew was going to happen at a set time, you could not call for mutual aid till the moment it happened. Kalb also asked why you couldn't call in all officers at any time. Whent explained that all officers had not put on "stand-by" the first night. In order to call people in on days off, they would have to be on "stand-by" which meant paying them stand-by pay. Join Councilmember Lynette McElhaney between 10:00p -2:00a tonight, July 26th, to fill the bars and streets with positive, peace-loving folks that love Oakland. We are hoping to get more eyes (and cell phones) on the streets to observe the planned Occupy Oakland demonstration. Fill in unofficial reports here!